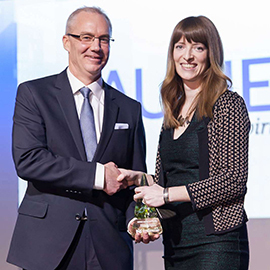 The Greater Kitchener-Waterloo Chamber of Commerce recently honoured Wilfrid Laurier University for being an environmental leader in the community. Laurier has emerged as a leader when it comes to being environmentally responsible, with the university’s Sustainability Office spearheading numerous projects since its creation in 2010. The Chamber of Commerce award recognized Laurier for several of its on-campus sustainability initiatives such as the university’s commitment to reduce its carbon emissions by 25 per cent over 10 years through a partnership with nonprofit organization Sustainable Waterloo Region; the implementation of a central waste program; and a sub-metering project that monitors energy use in all university buildings and displays information in real time on public interactive kiosks. The Chamber also rewarded Laurier for its initiatives run through community partners such as the university’s membership in the TravelWise program – which offers discounted bus passes, a carpool database and emergency ride home services to faculty and staff – and a partnership with nonprofit Young City Growers that resulted in the construction of a community garden on Laurier’s Northdale campus. These initiatives are just a few examples of how Laurier has made being sustainable and environmentally conscious an institutional priority.